Copyright © 2013 Sam Straw et al. This is an open access article distributed under the Creative Commons Attribution License, which permits unrestricted use, distribution, and reproduction in any medium, provided the original work is properly cited. Background: Nine proteins were identified as putative profibrotic biomarkers in systemic sclerosis (SSc) and an unrelated fibrotic disease in a previously published proteomic study. As the majority of these proteins were orphans of commercially available antibodies, the nine proteins were investigated to determine whether binding peptide aptamers of the Stefin A quadruple mutant-Tracy variant (referred to as “affimers”) could be validated by enzyme linked immunosorbant assay (ELISA) to allow the quantification of these candidate biomarkers in the sera of SSc patients. Materials and Methods: Candidate biomarker peptides were analysed by high throughput affimer microarray to identify binding affimers. Two candidate biomarkers were prioritised, and binding affimers were expressed from genetically modified BL21 competent E. coli strains and purified. These affimers were used in indirect ELISA, and then sandwich ELISA formats against the candidate biomarker recombinant proteins osteonectin and pigment epithetlium-derived factor (PEDF). 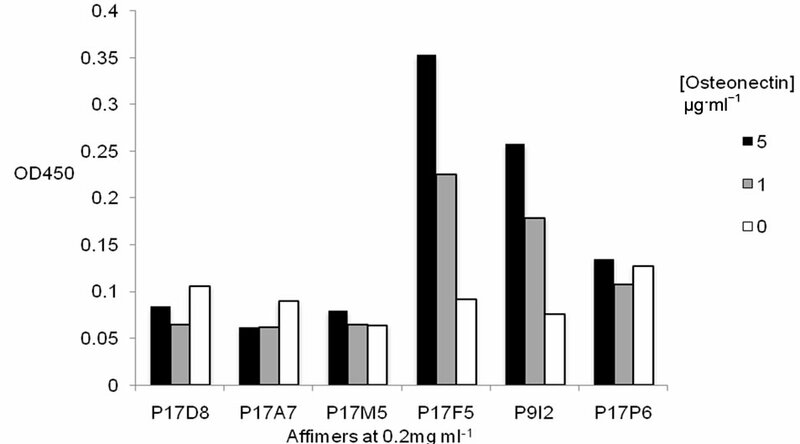 Results: 39 affimers were identified as binders for eight of the nine candidate biomarker peptides were by affimer microarray; six for osteonectin and eleven for PEDF. 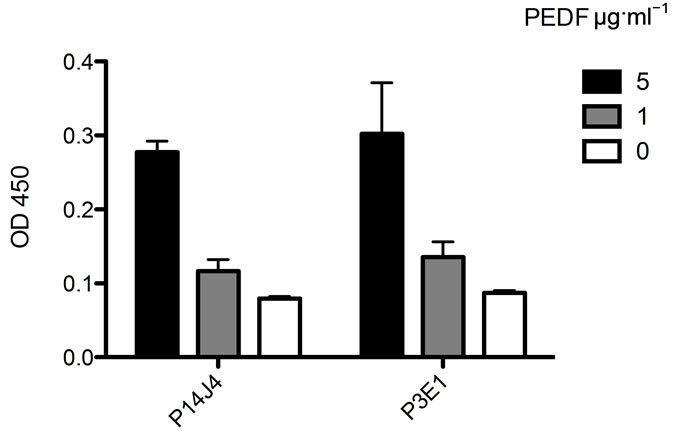 Two of the six and all eleven were able to recognize physiological concentrations (5 and 1 μg·ml−1) of osteonectin and PEDF, respectively by indirect ELISA. In sandwich ELISA format: two affimers were able to detect recombinant PEDF; however, the two affimers identified in indirect ELISA were unable to recognise recombinant osteonectin, and were thus hypothesised to bind to osteonectin at the same binding site. Discussion: SSc is currently an orphan of fully validated biomarkers, which is required for the development of stratified medicine in this field. This approach has laid the groundwork for an affimer based on multiplexed assay, to validate biomarkers in the sera of SSc patients in the future. Fibrotic disorders, which include systemic sclerosis (SSc) and the newly recognized nephrogenic systemic fibrosis (NSF), are conditions resulting from the abnormal production and deposition of collagen and other extracellular matrix proteins by aberrantly activated fibroblasts [1- 4]. SSc is an idiopathic, autoimmune disorder in which deposition occurs in the skin and internal organs, alongside a fibro proliferative vasculopathy [1,2,5]. NSF is in a non-autoimmune, non-vasculopathic condition resulting from exposure to gadolinium-containing contrast agents used in magnetic resonance imaging (MRI), in patients with reduced renal function [3,6]. These conditions are unrelated to many of their clinical features and underlying aetiology, but have a shared alteration to a profibrotic fibroblast phenotype . Fully validated biomarkers, which assist early diagnosis, allow patient stratification and provide a predictive prognostic value, are not available for SSc [2,7,8]. The current gold standard prognostic test used in clinical trials, the modified Rodnan skin score (MRSS) is flawed in terms of accuracy and reproducibility between observers [7,9-11]. Del Galdo et al. hypothesized that shared alterations in the proteome of cultured, explanted dermal fibroblasts taken from patients with SSc and NSF as opposed to healthy controls would reflect the proteins involved in the profibrotic fibroblast phenotype regardless of the triggering event, whether environmental exposure or autoimmune disease. The authors identified nine proteins: reticulocalbin-3, osteonectin, α2 chain of type I collagen, reticulocalbin-1, tropomyosin 4, enolase 1, calreticulin precursor, actin α1, pigment epithelium derived factor (PEDF), which if validated, may act as putative fibroblast profibrotic activity biomarkers . • Antibodies are large, complex molecules which require multiple disulfide bond formation and posttranslational glycosylation to attain stability and are thus difficult to express and scale up in vitro [13-15]. • The large size of antibodies may lead to steric hindrance and limit their utility in certain applications . • The constant region of the antibody facilitates many intracellular interactions and therefore leads to high levels of ‘background’ signal in multiplexed assays . • Antibody molecules have evolved to function in solution, whereas most clinical assays are performed upon a surface . • Antibodies are raised in animal hosts, which imply several ethical considerations, namely whether it is expensive and limited practically as not all proteins are immunogenic due to evolutionary conservation between humans and the host . • Antibodies are only commercially available for a very small percentage of the entire proteome  and the generation of novel antibodies is relatively slow, so is a rate limiting step in the validation of candidate biomarkers . • It is biologically neutral, as the restriction site was chosen so as to express the inserted peptide in what would otherwise be a protein-protein interaction site, thus losing the protease inhibitor activity . • It accepts peptide insertions at three points, which are distant in the primary structure but adjacent in the tertiary structure of the protein, each of which may interact with binding molecules differently, thus increasing the specificity of the peptide aptamers to their targets [15,17]. • It is unusually stable on surfaces and so may be printed into microarray format a lot easier than antibodies . • They display exquisite specificity and binding affinities comparable to antibodies Kd 10−6 - 5 × 10−9 M compared to Kd 10−7 - 10−11 M. As due to the constrained nature of the binding peptide, the conformational entropy lost upon binding is very low [12,13]. • It has been developed with a hexa-histidine tag allowing purification following expression . Here we use the term “affimers” for peptide aptamers derived from the SQT variant [15,18]. Song et al. have developed a BL21 competent E. coli expression library with 17,000 strains, genetically modified to synthesise a random affimer and resistant to the antibiotics kanamycin and chlroamphenicol . Alongside this, the authors developed a microarray with corresponding random affimers printed in duplicate ontonickel-nitrilotriacetic acid (Ni-NTA) coated glass slides (Xenopore) . This microarray and similar proof of concept microarrays have previously been shown to allow the detection of certain proteins in patient samples . The genetic sequence of E. coli strains, and therefore amino acid sequence of random peptide aptamers is unknown until characterisation, and so random affimers may be referred as “naïve affimers”. 1) That binding affimers to the nine candidate biomarker proteins identified by Del Galdo et al. may be identified by high throughput affimer microarray. 2) An enzyme-linked immunosorbant assay (ELISA) protocol may be optimized using affimers identified from microarray in place of antibodies for the detection of candidate biomarkers proteins. 3) Affimers may be identified which detect the protein biomarkers in sandwich ELISA format without the use of antibodies, thus allowing the development of multiplexed affimer based on biomarker detection in the future, i.e. detection of multiple biomarkers in a clinical sample. The affimer microarray was first blocked by incubation with 3% bovine serum albumin (BSA) in phosphate buffered salinesolution (PBS) with 0.1% [v/v] Tween 20 (PBST) at room temperature with shaking on reciprocal mixer at 60 rpm for 1 h 45 min. Following blocking, the microarray slides were incubated separately with nine candidate biomarker peptides (see introduction) which had been synthesized and biotinylated by a third party (China Peptides) at a concentration of 300 ng·ml−1 in 2 ml PBST. Incubation was performed at room temperature, on reciprocal mixer at 60 rpm for 1 h. Control microarray was carried out without biotin linked candidate biomarker peptide to detect affimers, which bound to strepta-vidincy3 conjugate (see below). One peptide, PEDF, did not generate “hits”and so recombinant human PEDF (Abcam) was biotinylated by amine coupling and then probed as above. Briefly, 1 μg PEDF was dissolved in 50 μl PBS and 0.8 μl EZ-link NHS-SS-biotin (Pierce) was added at a concentration of 0.2 mg·ml−1 in dimethylsulfoxide solution (DMSO) and incubated for 1 h. A bio-spin 6 chromatography column (Bio-Rad) was centrifuged at 1000 g for 2 min, sample added and then spun again at 1000 g for 4 min to desalt biotin from the PEDF sample as per the manufacturer’s instructions . Biotinylation was confirmed by ELISA. Briefly, samples were added alongside a known concentration of PEDF in PBS. Mouse anti-PEDF (Merck) was incubated at a concentration of 1 in 1000 in 3% BSA in PBS and then sheep anti-mouse horseradish peroxidase (HRP) conjugate (Sigma) to detect the presence of PEDF, and separately with streptavidin-HRP (BD Biosciences) 1 in 1000 in 3% BSA in PBS to detect the presence of biotin. All reagents were incubated for 1 h at room temperature, with washing with PBST [v/v] 0.05% four times between incubations. 50 μl 3,3’,5,5’-tertramethl-benzidine (TMB) was added and reaction arrested with 50 μl 0.5 M hydrochloric acid (HCl) after observable colour change and optical density measured at 450 nm (OD450) by Multiskan EX plate reader and Ascent software. • Signal (foreground) > [signal (background) + 2 standard deviations signal (background)]. • 2 adjacent spots, as affimers were printed in duplicate. • Specific for a particular candidate biomarker. Many spots were non-specific, having affinity for more than one biotin linked candidate biomarker or streptavidin (control). Due to commercially available antibodies to the proteins osteonectin and PEDF, these proteins were prioritized for further investigation until a non-antibody validation protocol could be optimized. Expression and purification of naïve affimers was conducted by the method developed by Song et al. with some modifications. Hits obtained were matched with corresponding BL21 competent E. coli strains in the affimer expression library developed by Song et al. and a starter cell culture was madewith 5 ml Luria-Beltani (LB) medium (10 g·l−1 triyptone, 10 g·l−1 NaCl, 5 g·l−1 yeast extract in distilled water, autoclaved at 121˚C for 20 min) supplemented with 30 μg·ml−1 chloramphenicol and 30 μg·ml−1 kanamycin. Cells were allowed to grow overnight in a Brunswick mixer at 37˚C and 250 rpm. Cell cultures were then expanded 100-fold in 500 ml LB medium with supplemented 30 μg·ml−1 chloramphenicol and 30 μg·ml−1 kanamycin and grown to OD600 0.2 - 0.3 measured by spectrophotometer. To induce the expression of affimers, isopropyl-β-D-thioglactoside (IPTG) was added at a concentration of 0.1 mM and induced at 37˚C and 250 rpm for 2 h. E. coli were harvested from culture by centrifugation at 4000 rpm at 4˚C for 5 min. Supernatant was discarded and pellets were stored at −20˚C or immediately purified. Harvested E. coli were suspended in 20 ml lysis buffer (0.1 M sodium phosphate solution, pH 7.4 with 300 mM NaCl, 1 in 10 pop culture (Novagen) and benzonase (Novagen) at 5 unitsml-1) and incubated at room temperature on reciprocal mixer at 60 rpm for 30 min. Cell debris was removed by centrifugation at 4000 rpm, 4˚C for 20 min. 1 ml his-select cobalt affinity gel (Sigma) was added to a 45 - 90 μm chromatography column (Evergreen Scientific) and washed twice with 10 ml 0.1 M sodium phosphate pH 7.4 with 300 mM NaCl to remove ethanol. Supernatant was added to the chromatography column and mixed with his-select cobalt affinity gel for 1 h at 4˚C to allow binding of affimers (see introduction). Non-specific binding was removed by washing ten times with 10 ml 0.1 M sodium phosphate pH 7.4 with 300 mM NaCl with agitation by pipetting every five washes. Affimers bound to his-tag cobalt gel were eluted by adding 800 μl elution buffer (PBS with 300 mM NaCl, 0.25 M imidazole), mixing briefly and incubating for 3 min before elution. The concentration of affimers and contaminant E. coli proteins was determined with measurement by Nanodrop (setting: protein A280), and elution repeated until the concentration fell below 0.1 mg·ml−1. The purity of obtained affimers was determined by polyacrylamide gel electrophoresis with 15% sodium dodecyl sulphate, followed by staining with coomassie stain (Thermo Scientific) for 3 - 4 h at room temperature or 4˚C overnight. Following this, destaining with 20% [v/v] methanol and 10% [v/v] acetic acid in distilled water, and then equilibrilation in a storage solution of 5% [v/v] acetic acidin distilled water for 1 h. Samples were qualitatively assessed for the presence of one band at 11 kDa with minimal contaminant E. coli proteins. Expression and purification of affimers was repeated for samples judged to be qualitatively impure. The use of affimers in ELISA format is a novel approach. Previously, naïve affimers identified from microarray have been compiled into a smaller microarray format and used to probe for their targets in patient sample , however in the future multiplexed assays will be performed in ELISA format, thus ELISA protocol optimization was essential. The applicability of the affimers also depends upon their ability to bind to the (folded) recombinant protein, as well as the (linear) peptide, and so recombinant proteins were used in the development of the ELISA protocol. Thus the bulk of the project was to develop a protocol for the validation of binding affimers by indirect and then sandwich ELISA. Table 1. Identification of affimers for osteonectin and PEDF which were further investigated. Affimer identifications correspond to hits obtained from microarray (data not shown). Identification code gives the location of affimer within the E. coli expression library, for example: P1A1 = plate 1, row A, column 1.
previous experiment with a greater concentration of affimer (0.8 mg·ml−1) failed, as did repetition with denatured osteonectin, hypothesized to present affimer binding sites hidden within the folded protein. Coating the surface of the 96-well plate with recombinant osteonectin was the next approach utilized. However, the initial experiment failed, most probably due to the presence of BSA in the initial coating solution, which outcompeted the recombinant osteonectin to bind to the wells. The final approach utilized osteonectin dissolved in PBS to coat the wells and over several attempts the experimental conditions were modified including changes to: reagents, incubation times, temperatures, washing reagents and repetitions. The final protocol is detailed below. Figure 1. Diagram of ELISA protocols. Indirect ELISA (above): protein (recombinant osteonectin or PEDF) was used to coat the well. Appropriate affimers bind to the protein. 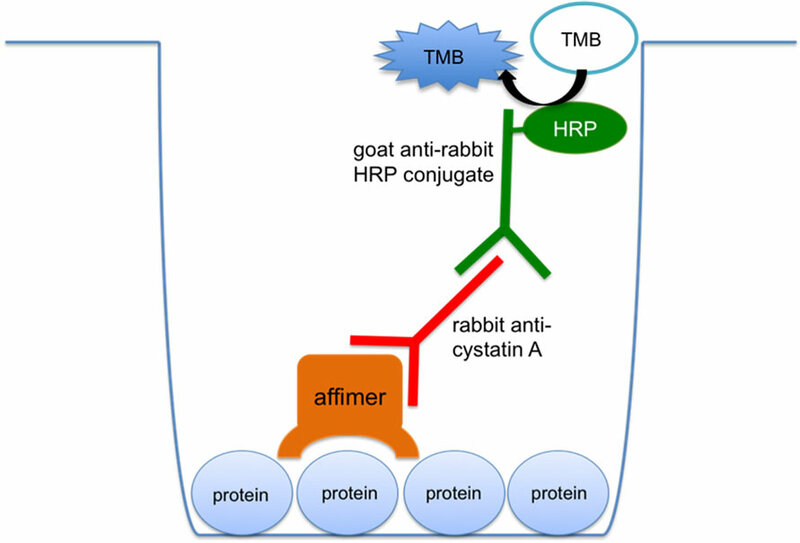 Rabbit anti-cystatin A antibody binds to the bound affimer (anti-cystatin A is an antibody against the SQT scaffold) and goat anti-rabbit HRP conjugate antibody binds to anti-cystatin A. HRP catalyses the conversion of TMB substrate to a coloured product, the concentration of which was measured as OD450 following arresting reaction with HCl. Sandwich ELISA (below): the well was coated with capture affimer. Protein is bound to the capture affimer, and a biotinylated detection affimer binds to the same protein at a seperate binding site. Streptavidin HRP conjugate binds to biotin, and HRP catalyses the conversion of TMB substrate to a coloured product, the concentration of which was measured as OD450 following arresting of reaction with HCl. ticeable colour change or 20 min. OD450 was measured by Multiskan EX plate reader and Ascent software. This successful protocol was subsequently used to validate naïve affimer “hits” against the PEDF protein (Table 1). An alternative indirect ELISA was carried out to determine whether with the established experimental conditions the proteins osteonectin and PEDF could be detected with wells coated with the appropriate affimers. Briefly, a high binding 96-well plate was incubated with a consistent concentration (0.2 mg·ml−1) of the affimers P9I2 and P17F5 (against osteonectin) and P14J4 and P3E1 (against PEDF) overnight at 4˚C. P9I2 and P17F5 were chosen as the two affimesr which bound to recombinant osteonectin in indirect ELISA (Figure 2), whilst P14J4 and P3E1 were chosen as affimers with highest affinity for recombinant PEDF in indirect ELISA (Figure 3). Figure 2. Bar graph to show OD450 measured after incubating osteonectin with affimers identified by affimer microarray in indirect ELISA format. Optical density is proportional to the extent of binding and therefore the affinity of affimers for osteonectin. Figure 3. Bar graph to show OD450 measured after incubating PEDF with affimers identified by affimer microarray in indirect ELISA format. Optical density is proportional to the extent of binding and therefore the affinity of affimers for PEDF. Affimers were discarded and blocking followed by washing was performed as described previously (see indirect affimer ELISA). Recombinant osteonectin and PEDF proteins were applied to the appropriate affimers at concentrations of 5, 1, and 0 μg·ml−1 in duplicate and incubation for 1 h at room temperature on ELISA plate mixer at 250 rpm. Washing and then incubation with rabbit anti-osteonectin(Merck) and mouse anti-PEDF (Merck) at a concentration of 1 in 1000 in 3% BSA in PBS. Washing and then incubation with goat anti-rabbit HRP conjugate (Santa Cruz Biotechnology) and sheep antimouse HRP conjugate (Sigma) as appropriate. Following washing, detection was performed as described previously (see indirect affimer ELISA). Using the reaction conditions established by the indirect affimer ELISA, a sandwich ELISA was performed to validate the binding of the affimers P17F5 and P9I2 to recombinant osteonectin, and P14J4 and P3E1 to recombinant PEDF in indirect ELISA. A high binding 96-well plate was coated with each capturing affimer at a consistent concentration (0.2 mg·ml−1) overnight at 4˚C. This was followed by blocking and then washing as described previously (see indirect affimer ELISA) and then application of peptide at varying concentrations (5, 1 and 0 μg·ml−1) in duplicate with incubation for 1 h at room temperature with mixing at 250 rpm on ELISA plate mixer. Following washing, 50 μl of a second, biotinylated detection affimer was added at a concentration of 0.2 mg·ml−1, i.e. the affimer P9I2 was used to coat the well and capture osteonectin protein and the affimer P17F5 was used for the detection or binding; and vice versa. The affimers P14J4 and P3E1 were used for the protein recombinant PEDF. 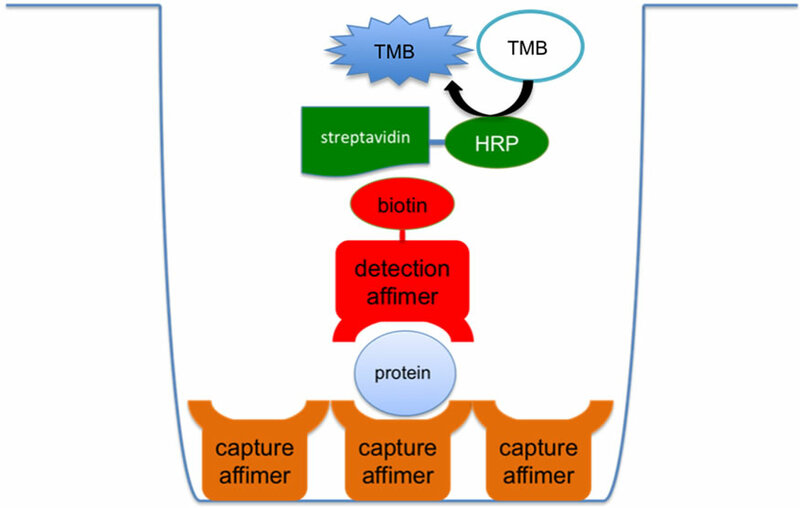 The detection affimer was biotinylated to allow detection by application by streptavidin-HRP conjugate. Briefly, a 0.2 mg·ml−1 affimer solution was buffer exchanged to PBS in order to remove imidazole which would reduced the extent of amine coupled biotinylation. 500 μl PBS was applied to Bio-Spin 6 chromatography columns (Bio Rad) followed by centrifugation at 1000 g for 1 min four times. Following this, 400 μl affimer solution was applied followed by centrifugation for 4 min at 1000 g as per the manufacturer’s instructions . 6.4 μl of 0.2 mg·ml−1 EZ-link NHS-SS biotin (Pierce) in DMSO was added to affimer solution and the procedure continued as described previously (see probing of naïve affimer microarray with candidate biomarker peptides). Following incubation with biotinylated affimer, washing was performed followed by incubation with streptavidin-HRP conjugate (BD Biosciences) 1 in 1000 3% BSA in PBS. Following washing, TMB and HCl were applied as above and OD450 measured. In total 39 binding affimers were identified against eight out of nine candidate biomarker peptides. Examples of affimer microarray and “hit” from microarray are shown in Figure 4. 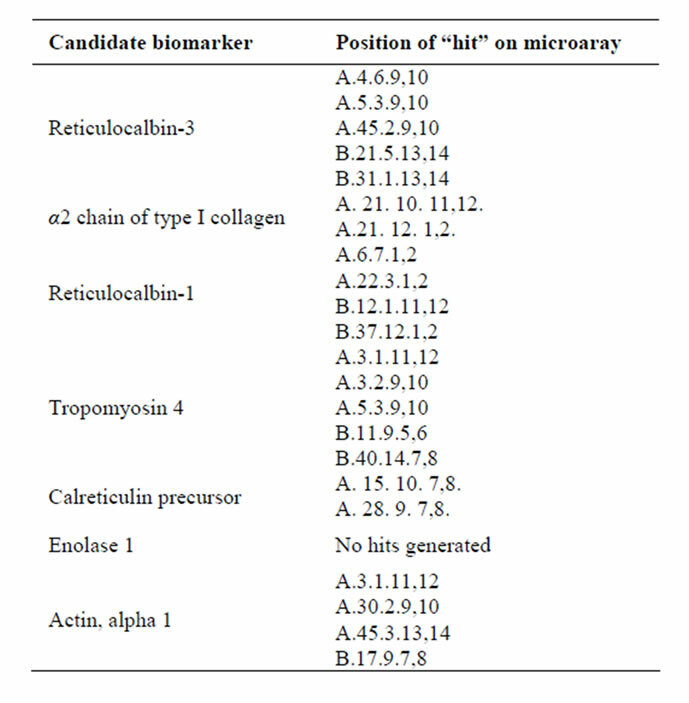 A summary of the “hits” identified in affimer microarray is shown in Table 2. 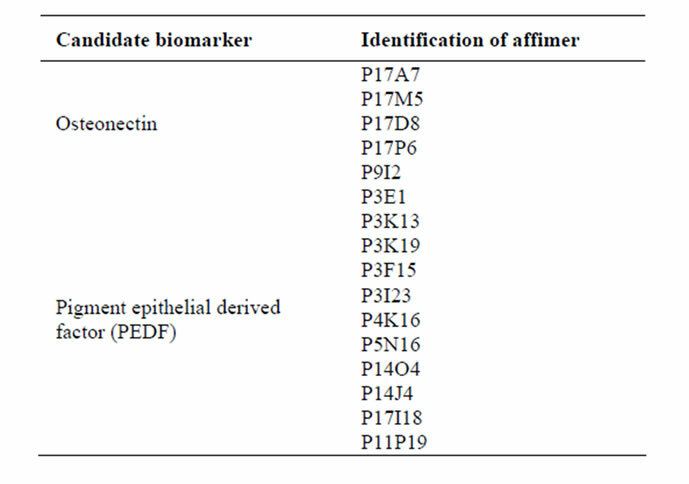 Affimers that bound to osteonectin and PEDF in affimer microarray, prioritised for further investigation are described in Table 1. Figure 4. 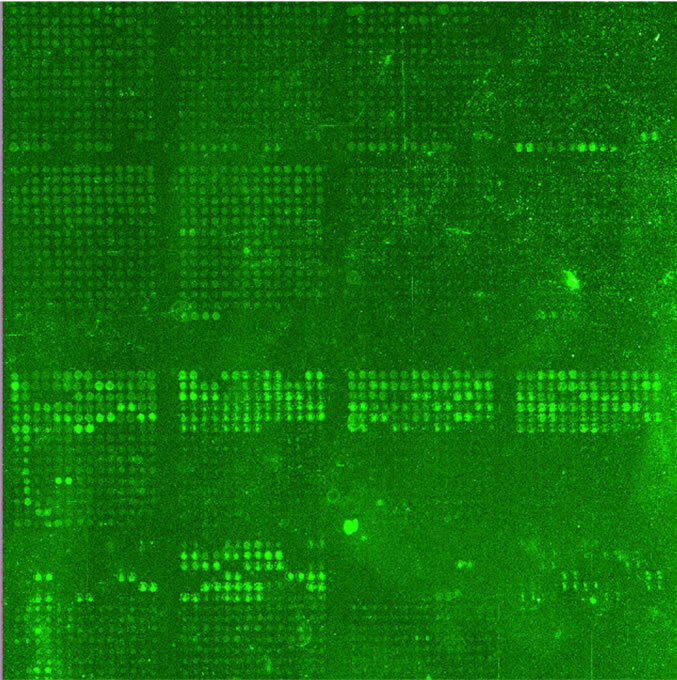 Example microarrays. Showing the appearance of a typical microarray viewed by Genepix 4.0 software (above) and an example of a “hit” (below) (calrecticulin precursor, A. 15. 10. 7,8. ), the two adjacent spots with signal intensity above the background and surrounding spots. Table 2. “Hits” obtained by microarray for candidate biomarkers. 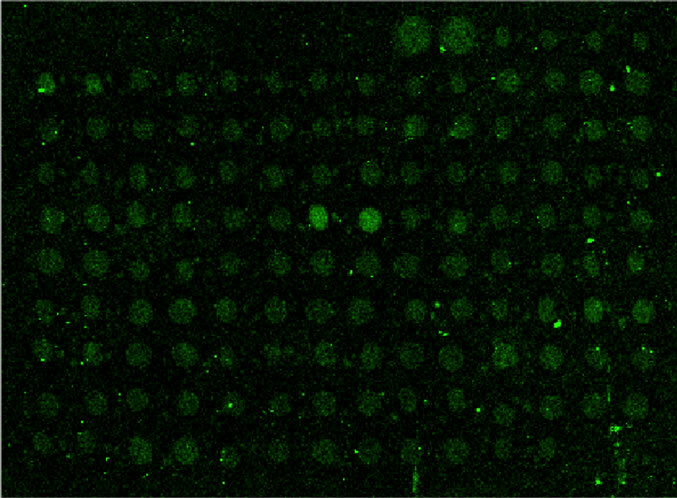 Each “hit” represents the position of an affimer on microarray. For example: A.1.1.1,2. = Microarray slide A, block 1, row 1, columns 1 and 2. The affimers P17F5 and P9I2 are able to bind to recombinant human osteonectin in indirect ELISA format. Furthermore, they are able to distinguish between concentrations of 5, 1 and 0 μg·ml−1. A second ELISA with affimers at 0.02 mg·ml−1 was also carried out but this generated unremarkable results (data not shown). Affimers which were not able to detect osteonectin in ELISA format were hypothesized to be either low affinity binders, or act on binding sites within the structure of the folded recombinant protein (Figure 2). 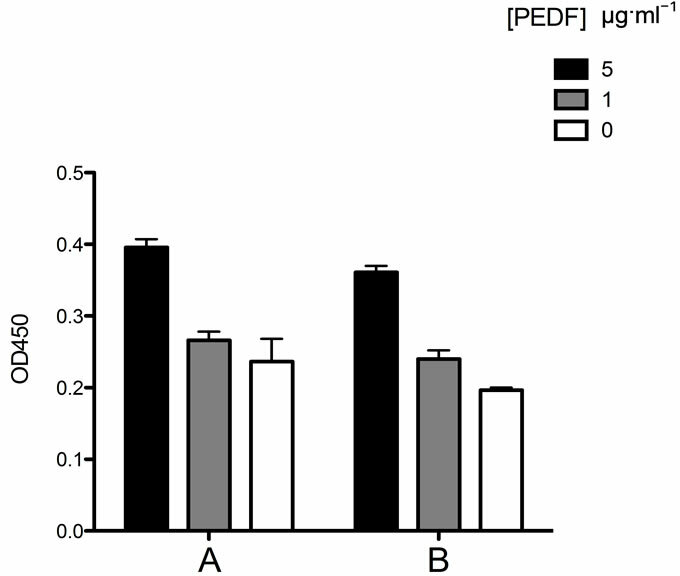 All affimers were able to distinguish between physiological concentrations of PEDF. A second ELISA with 0.4 mg·ml−1 affimers was completed (data not shown), but as with osteonectin, 0.2 mg·ml−1 was sufficient. As the initial microarray probing was carried out with the recombinant PEDF protein, it was hypothesised that all affimers would be able to detect recombinant PEDF in indirect ELISA, which was the case (Figure 3). The highest affinity affimers identified against PEDF in indirect ELISA were able to identify PEDF in reverse indirect affimer ELISA (Figure 5). As with previous experiments, affimers were unable to detect the presence of osteonectin in reverse affimer ELISA (data not shown). It is hypothesized that this was due to the nature of the osteonectin antibody, which may have bound to the well despite a thorough blocking protocol. The affimers P14J4 and P3E1 were able to detect recombinant PEDF in sandwich ELISA format, whilst using P14J4 as capturing affimer, P3E1 as detection affimer and vice versa (Figure 6). Figure 5. Bar graph to show mean and standard error OD450 measured after incubating affimers identified by affimer microarray with PEDF in reverse indirect ELISA format. Optical density is proportional to the extent of binding and therefore the affinity of affimers for PEDF. Figure 6. Bar graph to show PEDF and affimers in sandwich ELISA. Data series A represents mean and standard error of OD450 measured for sandwich ELISA protocol which used P14J4 as the capture affimer and P3E1 as the detection affimer. Data series B shows mean and standard error of OD450 measured for sandwich ELISA protocol which used P3E1 as the capture affimer and P14J4 as the detection affimer. Affimers were used against the protein recombinant PEDF. assays will need to be feasible, reliable, robust, and ideally, rapid [7,13]. SSc is a highly heterogeneous condition in terms of the extent of internal organ involvement and prognosis and therefore it is an ideal candidate for a stratified approach to treatment [2,7]. SSc is an orphan in respect to disease activity biomarkers and effective treatments, whilst the current gold standard prognostic test, the modified Rodnan skin score has been shown to be inaccurate between observers [23,24]. Thus, it is generally accepted that the development of quantitative measurements of disease progression would improve the performance of clinical trials (which most often fail to detect clinically and statistically significant changes in disease activity [25,26]) and allow better patient management [3,9]. This project represents a step towards this goal for SSc, allowing the implementation of a tool for quantification in the sera of proteins that may reflect disease activity . The biggest challenge in identifying disease biomarkers is not the discovery but in the validation process. Systemic sclerosis has a prevalence of only approximately 1:10,000  which is reflected by a relative paucity of clinical samples available for study. The 1500 serum samples held by the European scleroderma research and trials consortium are divided amongst European research groups and priority given to validated platforms (typically 50 μl per serum sample). Thus for the validation of several serum biomarkers, a multiplexed assay is extremely advantageous. To date, the development of multiplexed testing has not heen taken place, most probably due to the nature of antibody molecules (see introduction) and the relatively slow development of novel antibodies . Here, we draw together the work of two very different research groups with the intention of developing a novel, nonantibody technology for the application of identifying biomarkers in systemic sclerosis. We show that by the use of affimer microarray and affimer ELISA, we are able to identify approximately physiological concentrations of soluble proteins in vitro: the mean serum concentration of osteonectin and PEDF in the healthy population has been shown to be 1.62 ± 0.36 μg·ml−1  and 14.6 ± 3.2 μg·ml−1 respectively . The approach of identifying biomarkers obtained from cultured explanted dermal fibroblasts relies upon the assumption that preferentially expressed proteins would also be present in vivo in patient serum. To address this criticism Del Galdo et al. have demonstrated the presence of at least one of these proteins (reticulocalbin-1) in patient serum . However, there remains the possibility that the concentration of this protein and others in serum may either be undetectable or not reflect disease activity. Another problem associated with the Del Galdo et al. study is that it was conducted with a small patient sample SSc n = 3, NSF n = 3 and control n = 3 . Thus differential changes in protein expression within this small patient sample may not be reflected in a larger cohort of patients. An answer to this criticism is that Del Galdo et al. used an unbiased non-hypothesis driven approach, but managed to identify proteins known to form a part of the fibrotic process (α2 chain of type I collagen, α-smooth muscle actin and osteonectin) suggesting that the findings are a genuine reflection of the profibrotic phenotype . There were several weaknesses with the study design adopted here. The first is that we have developed low affinity binding affimers which work at concentrations of around 0.2 mg·ml−1 but have been shown not to work at concentrations of 0.02 mg·ml−1 (see results). For comparison, the commercially available antibodies utilised during this experiment were used at concentrations of between 0.2 - 1 μg·ml−1. This criticism is addressed by the fact that affimers may be produced in considerably higher quantities, and considerably less expensive than their antibody counterparts. Secondly, higher affinity affimers may be engineered relatively simple from the low affinity affimers identified in this experiment (see the final paragraph). The identification of only low affinity affimers was due to the nature of the affimer microarray. This high throughput screening experiment was carried out with a microarray of 104 (17,000) peptide aptamers (affimers). An alternative technology—phage display allows libraryies of complexity of 1012 - 1015 peptide aptamers to be developed which allow the screening of many more potential peptide aptamers, and thus there is a higher chance of identifying a high affinity aptamers [16,30]. However, the advantages of peptide aptamer microarrays are that large volumes of data may be generated in a short amount of time (due to automisation) and with relatively small volume samples . Furthermore, this experiment and others like it [13,19] pave the way for the future development of microarrays with much greater complexity. Another weakness of this study is that an adequate control was not possible for affimer microarray. The control study used was to detect affimers, which were bound to streptavidin, a reagent used in the microarray procedure (see materials and methods). However, there is the possibility that certain affimers are bound to binding sites on the proteins in question, which are shared with other proteins not investigated. However, this criticism becomes less relevant as several validated affimers allow the detection of proteins at multiple binding sites, which are less likely to be shared by unrelated proteins. A further criticism which may be made against this study is that it failed to validate measurements of relevant proteins in patient sera. Thus the data presented here may be regarded as preliminary. Since we have demonstrated that the approach of developing a sandwich assay from a high throughput microarray screening is feasible and potentially very informative, we envisage that future work should be done for the complete validation (by ELISA) of all affimers that have been identified by microarray (see Table 2). Furthermore, given the known genetic sequence of the affimer plasmid, it is a relatively simple task to perform studies of site directed mutagenesis and identify affimers with higher affinity for the protein of interest. The characterisation of high affinity affimers would allow a swift implementation at clinical level of a multiplexed affimer based on assay to measure biomarkers of fibrotic activity in SSc sera. Moon, K.W., et al. (2011) The correlation between durometer score and modified Rodnan skin score in systemic sclerosis. Rheumatology International, 32, 2465- 2470. Furst, D., et al. (2007) Systemic sclerosis—Continuing progress in developing clinical measures of response. Journal of Rheumatology, 34, 1194-200. S, S. (2012) Stratified medicine approach for systemic sclerosis: State of the art and the need for clinical biomarkers. Unpublished Literature Review for Clinical Sciences Programme. Clements, P.J., et al. (1993) Skin thickness score in systemic sclerosis: An assessment of interobserver variability in 3 independent studies. Journal of Rheumatology, 20, 1892-1896. Song, Q., McGonagle, D., et al. (2011) Scannin microbaray identifying protein biomarkers in inflammatory diseases. Leeds Institute of Molecular Medicine. Ionescu, R., et al. (2010) Repeated teaching courses of the modified Rodnan skin score in systemic sclerosis. Clinical and Experimental Rheumatology, 28, S37-S41. Furst, D.E., et al. (1998) The modified Rodnan skin score is an accurate reflection of skin biopsy thickness in systemic sclerosis. Journal of Rheumatology, 25, 84-88. HRP: horseradish peroxidase TMB: 3,3’,5,5’-tetramethylbenzidine HCl: hydrochloric acid OD: optical density, or absorbance calculated using ELISA plate reader or spectrophotometer. OD450 = optical density at 450 nm, OD600 = optical density at 600 nm.